Paint ~ Simply painting a room can have a dramatic effect, but hundreds of choices can be overwhelming! I’ll remove the stress of finding the perfect colors. I arrive with fan decks from all the local paint companies, and can leave you with recommended colors that will create a cohesive flow throughout your home. And yes, I do exteriors too! Furniture Placement ~You’ve just moved into a new home, but figuring out how to make the old furniture work in the new spaces has its challenges. Or, maybe you need to purchase some new pieces and aren’t sure what will work, and what size you should get. I can work with you on placement of your existing furniture, accessories and artwork in a way that suits your space and your needs, as well as give you ideas and resources for future purchases. I come armed with a tape measure and sketch pad, and can leave you with all the information you need to create rooms that suit your style and functional needs. “My husband and I bought a cosmetic fixer-upper about a year ago, and we had trouble figuring out where to begin. After reading about Kathy in the Mercury News, I checked out her website and decided to book a consultation. I’m really glad I did.” Read the rest of this testimonial, and others, on my Yelp profile. Upgrades & Remodeling ~ Ideas for your dream kitchen have been mulling around in your mind for years, or maybe you’d love to create that feeling of bringing the exterior-in for your family room. With my background in upgrades, remodeling and cabinet design, this is where downloading all the ideas and information in my mind will really benefit you! We will walk, talk, brainstorm and sketch our way to uncovering your home’s full potential. My main goal is to maximize what your home already has to offer, while staying within your budget. 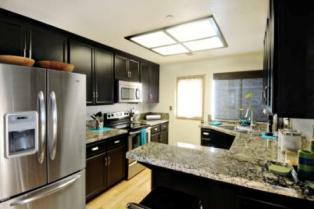 If a complete kitchen remodel isn’t possible, I’ll work with what you already have and give you ideas to make it shine. 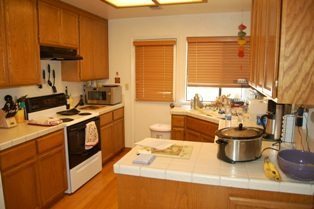 That’s exactly what I did with this 1980’s kitchen, while using their existing cabinets. Not ready to start on that project quite yet? Planning is everything, and this session is great for getting your game plan together so you have the information you need to make decisions on how, and when, you should proceed. Window Treatments ~ Shutters and shades and drapes, oh my! The choices are endless, and what should you put on your windows to make them both attractive and functional? Whether you’d like to purchase ready-made treatments from your local store, or have custom treatments made, I’ll work with you to narrow the options and recommend those that meet all of your needs. I proudly offer the Hunter Douglas line of products, and also have resources available to me for custom treatments. How can I maximize storage? Can I have an adult space that’s child friendly without being buried in toys? Summer is here, and my back patio desperately needs to look inviting! These are just a few of the areas I’ve helped other clients with, but nothing is off limits! You’ve got questions; I’ve got answers, and we can cover so much in this session. Design should be fun, not stressful, so contact me today to chat about your Designer Download® session. And if you need a little more in-depth service than this session offers, check out my Residential Refresher! I’m here to help you move forward with making your home reflect you!